While working on implementing a QBUS device on an FPGA we reached a point of writing the Verilog code for the bus arbitration. In one particular place in the code we could see, plain as day, that there was a race condition. This triggered a vague memory from years ago of being told about how there was a design flaw in the Unibus that could, on rare occasion, lead to a bus-arbitration failure, and that this was discovered and fixed in the QBUS design. So here was the problem we had heard about all those years ago, clear in the Verilog code, and that lead to an effort to understand the problem and find a workable solution. This paper is our attempt to document the results for the benefit of anyone who follows. As far as we know, this knowledge was passed word-of-mouth within the DEC community and has not been written down until now. We assume the reader has some knowledge of the Unibus and QBUS but may not know in detail how bus arbitration works on these two buses. For those details, refer to DEC’s PDP-11 Bus Handbook. It covers both the Unibus and QBUS and we will refer to timing diagrams by page number in that reference. A computer bus connects a processor (sometimes multiple processors) and peripheral devices together and allows data transfers between the various components. As a general rule, one and only one device may be in control of the bus at any time. Usually this would be the processor, reading and writing to memory and I/O devices as it executes instructions, but from time to time it is useful to hand off this bus-master role to other devices in the system, either so they can access memory directly (DMA) or so they can interrupt the processor and give it an interrupt vector. The mechanism whereby the processor hands over control of the bus to exactly one device is called bus arbitration. Computer designers have invented a variety of means of doing this arbitration but a generic description of how DEC does it on the Unibus and QBUS follows. A device requesting the bus asserts a common open-collector signal (wired OR) to the processor. When the processor sees this and is ready, the bus arbitration circuitry in the processor asserts a bus grant line that is daisy-chained down the bus (i.e. wired from an 'out' pin on one slot to an 'in' pin on the next sequential slot, for every pair of adjacent slots). Each device that is not requesting the bus simply repeats the bus grant signal along. The first device that is requesting the bus does not repeat the bus grant signal and assumes that it now has exclusive use of the bus. It asserts an acknowledgment back to the processor, and asserts its interrupt vector, or begins DMA operations as appropriate. Each of the four combinations of Unibus vs. QBUS and DMA vs. interrupts has little variations from that general description so we’ll briefly introduce those here. All the bus signals mentioned below, except the grants, are, like the request line, also common open-collector signal (wired-OR); i.e. they are broadcast to all devices on the bus. The Unibus NPG Arbitration Sequence allows a device to become bus master in order to perform DMA operations. The description, starting on page 36, follows the general description pretty closely. To start, a device requests the bus by asserting NPR. The bus arbitrator responds, when it’s ready, by asserting the daisy-chained signal NPG. The requesting device captures NPG (doesn’t pass it along to devices further down the chain) and asserts SACK to acknowledge the bus-grant; the arbitrator negates NPG when it sees that acknowledgment. Important note: the requesting device must not grab an NPG if it has already started passing it along for some other device. More on this later. The Unibus also has a priority Bus Grant system with four priority levels that work just like NPG but requests are made on BR[7..4] and the daisy-chained bus-grant signals are on BG[7..4]. Once a device becomes bus master, it may run either data transfer cycles (aka DMA) or an interrupt cycle to pass its interrupt vector to the processor. The QBUS DMA protocol is described starting on page 115 with the timing diagram Figure 2-8 on page 117. It follows the general description given above exactly. A device requesting the bus for DMA asserts DMR. 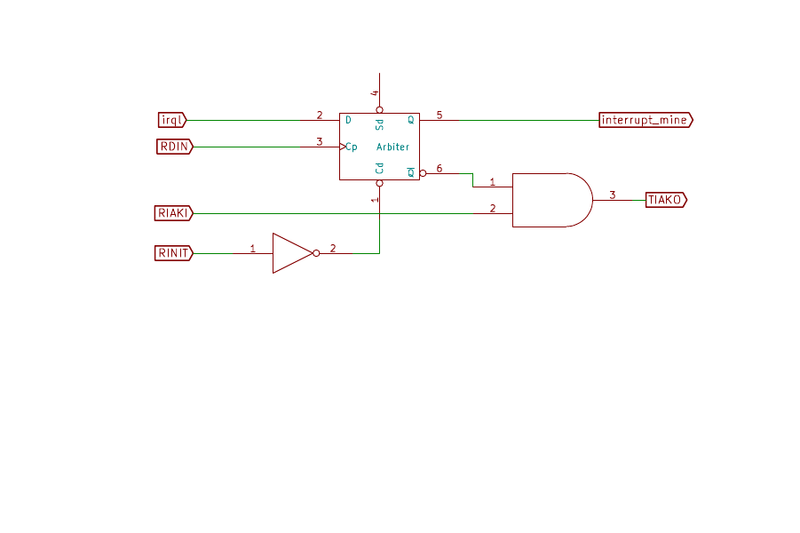 When the processor replies with DMGI the device does not pass this through by asserting DMGO to the next device (not shown in the timing diagram) but captures that bus grant for itself and asserts SACK to acknowledge that it has the bus. It then clears DMR which it was asserting, goes on to do its DMA operations, and clears SACK when it is done. The QBUS interrupt protocol diverges the most from the general description we’ve been using. The basic ideas are the same but there are a bunch of details that differ. The big difference is that for Unibus interrupts, the interrupt device becomes bus master and then runs an INTR bus cycle to send its interrupt vector to the processor. On the QBUS, the device runs through the bus arbitration but then the processor reads the interrupt vector from the device similarly to how the processor would read an I/O register from the device. The interrupt protocol description starts on page 117 with the timing diagram figure 2-10 on page 120. The QBUS has four different interrupt request lines IRQ4, IRQ5, IRQ6, and IRQ7. A single shared daisy-chained "bus grant" comes back down the bus and into a device as IAKI and continues out of the device as IAKO. A device that’s requesting an interrupt will not pass an incoming IAKI to IAKO, but will assume that it has won the bus arbitration. At that point it deasserts its request, asserts RPLY and its interrupt vector, and then removes RPLY and its interrupt vector when it sees IAKI go away. There is a little more complication with not capturing a bus grant if someone at higher priority is requesting an interrupt but that’s not relevant to the discussion here about bus arbitration. The other variation that we have skipped until now is the DIN signal. We will come back to this but, for now, just note that DIN (normally used to signal a read cycle on the bus) is asserted with SYNC not asserted a minimum of 150ns before IAKI is asserted. This provides the device advance notice that an interrupt bus grant is coming soon. Now we focus in on just how a device decides if it is going to pass the bus grant signal through, or capture it for itself, thereby deciding that it has won the arbitration. This decision of whether to pass the bus grant signal or not is where the problem arises. We will use the QBUS DMA signal names to be specific in the examples. In this example, the bus_request signal is generated internally by the device whenever it decides it wants to acquire the bus for DMA operations. It is sure a nice, straightforward implementation but of course if that were all there was to it, I wouldn’t be writing this paper and you wouldn’t be reading it. Consider that the device can decide it wants the bus at any arbitrary time relative to whatever the processor or any other device on the bus is doing. So it is possible that the bus grant may come through as a result of a down-steam device’s request just before this device asserts bus_request. In that case, TDMGO is asserted briefly and then the device "takes it back". Besides being downright rude, this can easily result in two devices both thinking that they own the bus and chaos ensures when they both start running DMA operations. Given the design of the Unibus and QBUS with open-collector bus drivers this is unlikely to let out the magic smoke but scrambling memory or the data on your disk is almost guaranteed. A latch is a circuit with feedback — i.e. an output is connected back to an input. In line with the axiom that 'digital circuits are made out of analog parts', this feedback is not digital (i.e. restricted to '0' or '1'), but may be any intermediate voltage. Generally, if the output is 'toward' one of those two values, the circuit moves quickly (via feedback) all the way to that value. However, if it is balanced precisely in the middle, it may take a while before it fluctuates to one side or the other, and then rapidly moves to that value. The race condition is between the clock to the latch and the data input. As they change closer together, the setup and hold time limitations mentioned above are violated, and the probability of the latch going meta-stable increase. Note that there is no way to avoid this situation (and considerable theoretical work has gone into studying it, and 'proves' that there is no solution). The best one can do is create circuits that ask 'is it still trying to decide', and if so, wait. Since bus_request can happen at any time relative to bus grant (RDMGI), these setup and hold times cannot be guaranteed and the output of the arbiter may go meta-stable. This is a fundamental property of any arbiter. The fix is to wait a while to let the meta-stability settle out. While there is no time interval you can specify that guarantees success, the longer you wait the better your chances and in reality it almost always does settle out pretty quickly. The key though is that you should not use the arbitration output immediately, and this circuit does use it immediately to gate the pass-through of RDMGI to TDMGO. In other words, it can result in a short pulse of grant being passed through, so that two devices decide that they won the bus arbitration and chaos reigns as described previously. Turns out the circuit here also has another problem; it glitches TDMGO when RDMGI comes in if bus_request is asserted. The short explanation of this glitch is that whenever an input signal travels two paths to an output signal, those two paths may take differing times and so you want to think about glitches. In more detail, if the circuit is quiescent then RDGMI is low and won_arbitration is low which makes Q high, therefore TDMGO is low. If bus_request is high and RDMGI goes high, Q is still high briefly so TDMGO will go high. In a very short interval, the propagation time of the flip-flop, Q will go low and TDMGO will go low again. However, this has glitched TDMGO and some device downstream that is also requesting DMA may think it just won the bus arbitration. The fix we will apply for the meta-stability problem will fix the glitch as well. The basic idea is simple. Since the problem comes from trying to use the arbitration output immediately, we should wait a while before using it. If we could do the arbitration some time before the bus grant signal arrived then we could let any meta-stability settle out before we had to pass gate bus grant through or not using that pre-decided answer. For the bus grant on Unibus or DMA on the QBUS, there is no early indication that a bus grant is soon to come but we can get that effect by running the bus grant through a delay. The un-delayed signal clocks the arbiter and the delayed bus grant is passed down the chain or not. Now the output of the Arbiter, possibly meta-stable, will not be sent out to TDMGO until 'delay' after RDMGI’s positive edge, by which time it ought to have stabilized on an answer to the question of whether bus_request or RDMGI happened first. The won_arbitration needs this type of protection as well. DEC’s DC010 Direct Memory Access Logic chip  uses a delay line just like this but since delay lines are not available in most FPGAs, we can use a bucket-brigade of flip-flops to get a similar effect. Note that this bucket-brigade is the same circuit as a synchronizer used when signals travel between clock domains. Propagation delay from BDMGI L to BDMGO L must be less than 500 ns per LSI-11 bus slot. Since this delay directly affects system performance, it should be kept as short as possible. 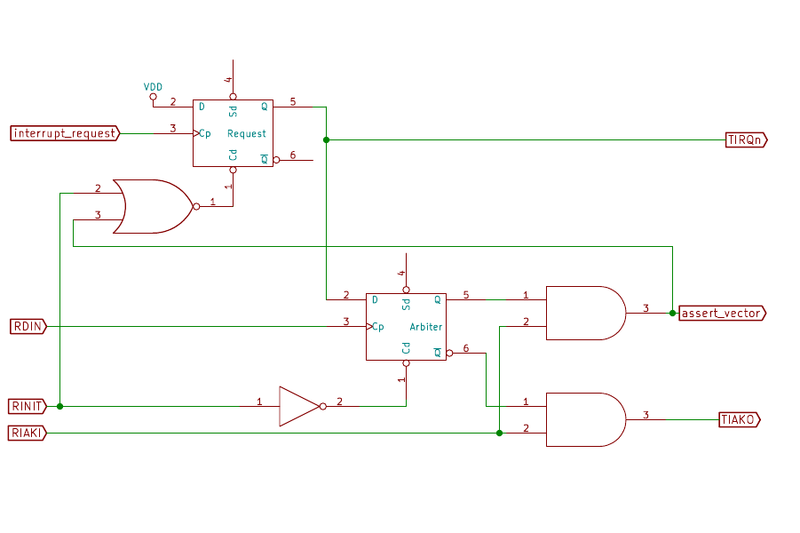 With a 20MHz clock, two flip-flops will add between 50ns and 100ns of delay depending on the phase relationship of the incoming bus grant with the clock, well within the spec. Looking at the timing table for the DC010 chip mentioned above,  the total propagation delay high-low is between 95 and 220ns while low-high is between 15 and 60ns. Apparently DEC considered delays of this order acceptable in practice as well as in theory. One final consideration comes up when implementing this on an FPGA. Specifically, what about that AND gate that’s feeding TDMGO and what happens if the output of the Arbiter flip-flop goes meta-stable for a little while? On a real AND gate, holding one input low means the output will be low no matter what the other input does. 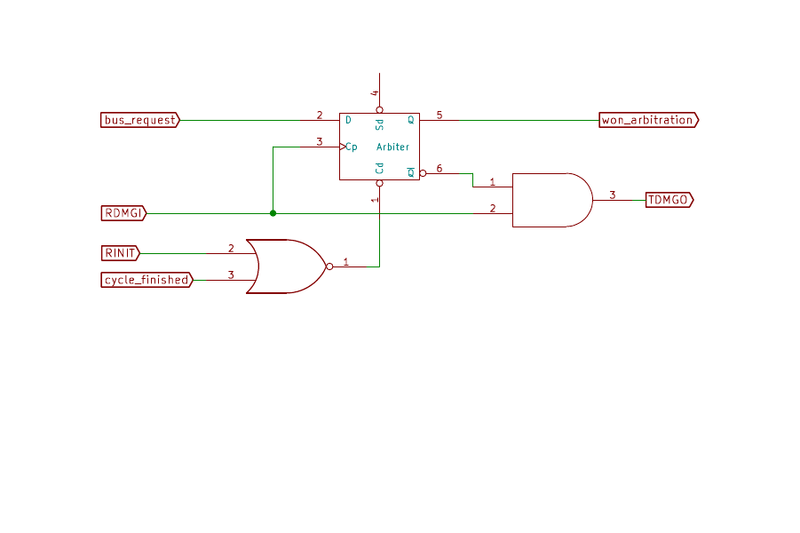 But what about an AND gate that’s implemented by other means, like the LUTs in an FPGA? It turns out that FPGA’s LUTs are built to be glitch-free in the face of a single input changing. So it’s a problem worth considering but, at least in the case of FPGAs, this works. We have used the QBUS for our specifics so far but it all works the same on the Unibus, just wire this circuit up to NPR/NPG or BRn/BGn depending on your desired priority. However, an interesting difference between the QBUS and Unibus happens once you’ve won arbitration and want to generate an interrupt. On the Unibus, the device runs an INTR bus cycle that basically writes the interrupt vector into the interrupt fielding processor. On the QBUS, after the arbitrator has granted the bus to some device requesting an interrupt, the processor runs what looks very much like a DATI cycle (bus read) to read the interrupt vector from the device. This means the implementation of interrupts on the Unibus vs QBUS are quite different once the bus arbitration is done. 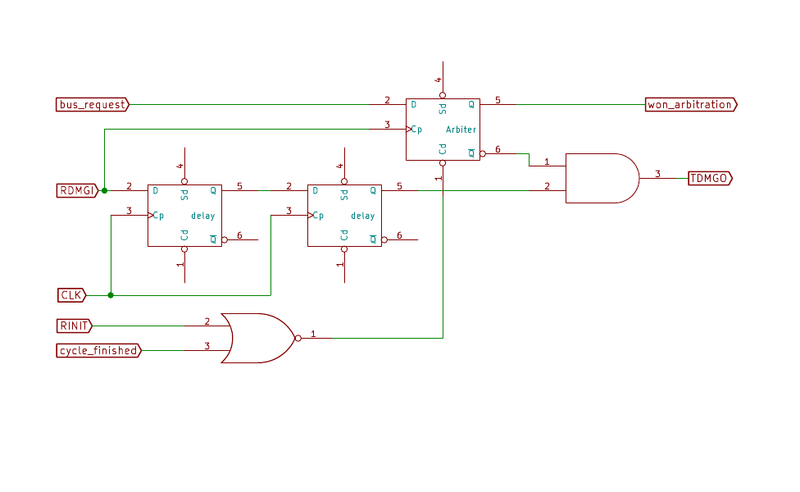 Implementing interrupts on a Unibus device needs a state machine — simpler than the DMA state machine but a state machine nonetheless — to sequence through the bus signals needed to run the INTR bus cycle. On the QBUS, interrupt processing on a slave device is simply another register read. It’s driven off RDIN and won_arbitration rather than an address match but it’s otherwise very similar. No state machine is needed, just combinational logic. This should look very similar to the bus grant logic we considered previously with the change that we clock the arbiter flip-flop off RDIN while we pass RIAKI rather than doing both off the bus grant. The irql signal is a latched version of the internal interrupt request line on the device and irq_higher is a calculation among the four QBUS interrupt request lines to make sure some higher priority interrupt isn’t currently being requested. Again, the output of the Arbiter may be meta-stable for a little while so those outputs should not be used until they have time to settle. Gating the output with RIAKI, which will be low during any potential meta-stability, provides that protection. The interrupt_mine signal gets this protection as well, as you’ll see below. One bit of subtlety here is that only RDIN clocks the Arbiter. Since RDIN is also used to signal DATI (data read) cycles on the QBUS, doesn’t that confuse things? The processor asserts RDIN while RSYNC is negated to provide the early indication that the it is about to assert RIAKI to read an interrupt vector. So why are we not including RSYNC in here somewhere? Well, we could but it turns out it doesn’t matter. Since the output of the Arbiter is only used when RIAKI gets asserted, clocking in irql on every RDIN transition doesn’t hurt anything and it simplifies the circuit a little. Also, once our interrupt vector is read and irql is negated, the next RDIN will clear the Arbiter flip-flop naturally so we don’t have to add some circuitry to deal with that. This is only a small piece of the QBUS interrupt circuitry and on the QBUS, unlike on the Unibus, the rest of the interrupt processing is a part of the bus arbitration sequence. So here is that arbiter in a little more context. 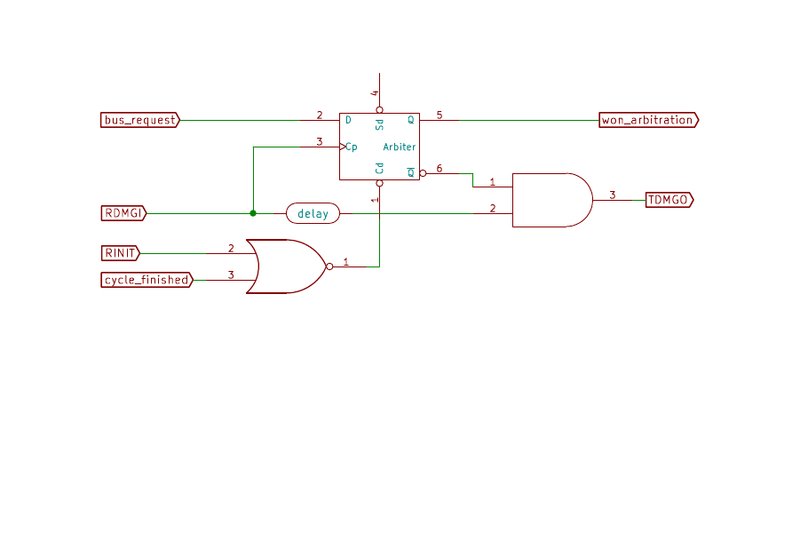 The interrupt_request line comes from the device when it wants to trigger an interrupt; TIRQn expands to the different IRQ signals depending on what priority this device is configured for; assert_vector is a signal to the register read circuitry that causes it to put the interrupt vector on the BDAL lines rather than I/O register contents; and, as before, the irq_higher logic has been omitted for clarity. When RIAKI comes in, we either pass it through to TIKAO or assert our own interrupt vector as determined by the bus arbitration flip-flop which was clocked off RDIN at least 150ns earlier. When we assert the interrupt vector, then we also clear the interrupt request flip-flop and negate TIRQn. There is no revealed wisdom here. These are just the opinions of the author and not inside information from DEC engineers. We present the information to aid those in the community who experiment with their own device designs. We welcome feedback and discussion to make this information as complete and correct as possible. The author gratefully acknowledges the assistance of Noel Chiappa in working through questions about how the Unibus and QBUS work as well as reviewing this paper not to mention starting the QSIC project  that lead to discovering all this stuff in the first place. 4. The formatting of the 1979 PDP-11 Bus Handbook seems to have gotten broken here. Immediately following the description of the NPG Arbitration Sequence, without any sort of header or break, the text goes into describing how to generate INTR cycles. Other Unibus descriptions make it clear that the NPG sequence is only for DMA and not for interrupts. 5. A note on QBUS signal terminology. A signal like DMR (DMA Request) may show up with three different names depending on how this signal is being considered, distinguished by a prefix letter. A leading B is the signal on the bus; it is inverted logic, that is an asserted signal is a low voltage (open-collector signals). A leading T indicates this is the signal transmitted by a board and a leading R indicates a received signal; these signals are not inverted. In addition, the daisy-chained signals (DMG and IAK) often have a trailing letter (I or O) to indicate if the signal is coming in (from the processor) or going out (away from the processor). 11. We are unable to find the Unibus spec for this delay.